In January 2015, I left cold Midwest waters to drive 800 miles south in search of a double-digit largemouth bass. Nebraska is full of quality fish, but the lingering cold temperatures rarely present the right conditions to produce ten pounders. I vividly remember the snow finally melting from my Hobie Pro Angler 14 halfway through Arkansas. My eyes lit up when I saw the Louisiana state sign after nearly 13 hours driving. I had three months to accomplish my bucket list. I figured the warmer water temperatures and spawning season would help me achieve my goal. I didn’t come to the south as a stranger. The charming state of Louisiana was my home for nearly ten years. Cypress trees, swamp waters, wasps and gators were no surprise. 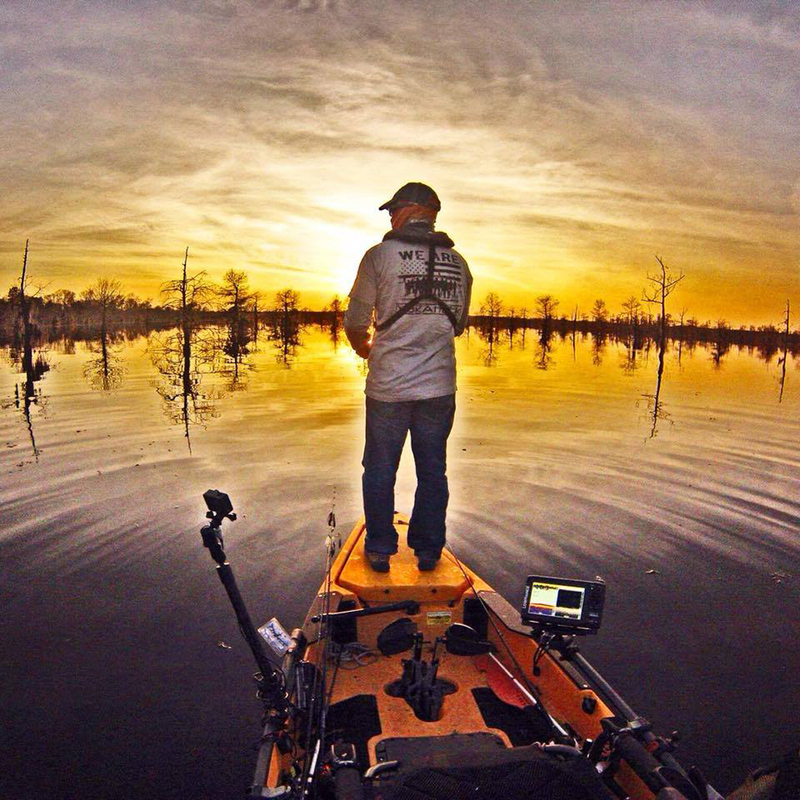 The quick growth of kayak fishing in the South was awesome. The fact that some of the friends I hadn’t seen in years are now ‘yak anglers was absolutely fantastic. When I arrived the January waters were in the forties and fishing was slow. I had to dig into my Midwest fishing bag of tricks. I gave into the dreaded drop shot to entice some suspended bass. As February came around, my hopes for warmer weather intensified. The fish grew more active as the water temperatures climbed into the mid fifties. I connected with a few four and five pounders and plenty of dinks. Then, the unexpected. A winter Armageddon hit the South with freezing temperatures and snow in Louisiana. I left Nebraska in hopes to get away from the snow and instead, it followed me across the state lines. I started to wonder if I was going to see spawning season at all during my short stay. Schools, airports and many roads were all closed. I spent endless hours in my hotel room staring at my rods. Then I ran into a Facebook post from a fellow Hobie Fishing Team member. He was holding a trophy bass caught in Texas while prefishing for a Kayak Bass Series tournament scheduled that weekend. Surprised, I realized the lake was only two hours away. I registered and drove the icy roads, arriving just in time for the captains’ meeting. Everything happened so fast, I’d had no chance to look for a hotel. I had no option but to rough it and sleep in my truck. I spent the night cranking the engine to get some heat. There was no time to scout. I only knew that Sam Rayburn reservoir has over 114,500 acres of fishing spots. I fired up my Lowrance Elite 7 CHIRP and saw a submerged road with significant drop-offs that could potentially produce fish on a Carolina rig. I’d have to pedal my Pro Angler four miles to get to it. It was a plan. Four o’clock came fast. I brewed some coffee, threw a couple of candy bars and bananas (bad luck right?) into my H-Crate and drove off to the Harvey Creek Park ramp. As I reached the end of my long four-mile pedal, I was disappointed to see several bass boats stacked on top of my submerged road. I felt a bit angry. With the water temperature in the low forties I knew the bass would be deep. I had no option but to start the morning on gentle drops with Rat-L-Traps, chatterbaits and jerkbaits. Then I noticed hundreds of coots floating near the point where the coveted submerged road comes into the lake. Could there be grass under them? I moved quietly in and quickly confirmed that there was indeed grass in the whole area. Skeptically, I worked a Texas-rigged baby brush hog in watermelon red through the three- to six-foot shallows. After a few casts, I felt a strong jolt. I gave the fish a second and set the hook like my life depended on it. I couldn’t believe the depth of the bend in my rod. A big yellow fish briefly flashed in the stained water. For a second I thought I’d snagged a carp. Then the bucket mouth breached the water. I kept my 65-pound braided line tight. I couldn’t let this beast spit the hook. I reached down, still wearing my old-school leather gloves, and grabbed the bass by the mouth. I could not believe that in one hour and a half I already had a giant in my yak. My heart was still racing and my hands shaking. I still had to photograph this mobile cinder block on my measuring board. The fish didn’t cooperate, but I managed a few good pictures. He measured 22 inches and weighed in at six pounds. After a successful release, I was pumped and ready to give my fellow anglers a run for their money. The next few hours proved to be very challenging. I was about to give up. With exactly five minutes left, I caught my last fish. It took the quickest catch, photo, and release of my life, but I just made it. At the award ceremony, the tournament director called my name as the third place angler as well as the Big Bass winner. With no time to prep or pre-fish such a big lake, I couldn’t believe my good fortune. March came with more cold fronts. I never did see a spawn during my three-month quest for a double-digit bass. As I headed back to Nebraska, I was far from sad. That shot-in-the-dark shallow water six pounder was a fish I could never forget.